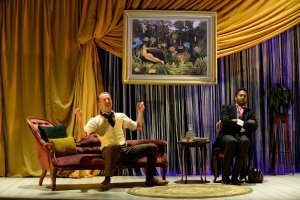 Oliver Brignall as Lord Reginald Fitzambey; Peter Brathwaite in George Bernard Shaw’s The Music Cure part of ‘Shaw Goes Wilde’. Pegasus Opera Company working in collaboration with Hagemann-Rosenthal Associates presents Shaw goes Wilde: comprising of two one-act operas based on Bernard Shaw’s The Music Cure and Oscar Wilde’s The Nightingale and the Rose. Performed in the newly opened Susie Sainsbury Theatre in the Royal Academy of Music. A state of the art theatre boasting amazing acoustics, comfortable seats and everything you expect to find in a luxury theatre just on a smaller scale. The opening first act based upon The Nightingale and the Rose by Wilde has been set against the backdrop of a garden coming to life through the early morning mist. Katie Grosett’s beautiful portrayal of the Nightingale brought elegance and grace to the rarely seen bird. With her captivating voice matching the smooth rhythms of dance representing the soft movement of the Nightingales wings. Performed by an extremely talented cast and an interesting selection of flora and fauna costumes, the piece was delivered clearly and was thoroughly enjoyable. I especially liked the lizard which Holly-Marie Bingham’s amazing posture and discipline kept firmly in place on her head throughout the entire performance. Pegasus Operatic Society state that their ethos is to “… promote opera in culturally diverse communities for all ages” this event certainly delivers their message. The stronger opera was by far the second act. Making an impact from the second the curtain rose. With strong angled walls, bold rich colours and the impressive polished baby grand piano on the right-hand side of the stage. The cast of three were extremely strong performers. Alison Buchanan’s voice is incredible and very moving. You cannot fail to see why she has such a long and varied portfolio in the opera industry. Oliver Brignall and Buchanan’s performance through this act was brilliantly directed by Louise Bakker. With two very strong personalities taking centre stage the flirtatious banter was extremely entertaining and some well-executed comedy parts – this side of opera is often overlooked. Philip Hagemann could be seen conducting his orchestra on the television screens positioned around the tier of the Dress Circle. Without one missed note both opera pieces were a sheer pleasure to listen to. There is something mysterious about watching a conductor performing when they are totally in tune with their music, as Hagemann clearly is with this production. A special mention to the wonderful set and costume designer Richard Evans is in order. Each set has been created completely different to the other, from the garden to the luxury hotel room. His visions helped to bring another dimension to this wonderful production. Opera as with many art forms has adopted the reputation of “high art” which in turn alienates large sections of society. How and why you enjoy art in any form is all that should matter. Trying something different and moving away from your comfort zone can be both challenging and enriching. The Pegasus Opera Company’s performances are a fantastic introduction to this thoroughly enjoyable genre of opera. The first act is The Nightingale and the Rose features themes of love and rejection. Oscar Wilde’s bittersweet production sees a student who falls for a young maiden, who demands the student show his feelings by giving her a red rose. Unable to find one, a nightingale offers to make a red rose for him. The production stars celebrated soprano Alison Buchanan, award-winning baritone Peter Brathwaite (Effigies of Wickedness at Gate Theatre), Oliver Brignall, Thomas Bennett, Angela Caesar (Caroline or Change at Playhouse Theatre), Katie Grosslet, Amal Khalidi and Nick Morton. The second act is The Music Cure, a satirical comedy set in the 1900s, which sees Lord Reginald being investigated by Parliament for insider trading. This unwanted scrutiny makes the Lord depressed, so his beloved mother hires a famous, dynamic female concert pianist to cheer him up. This tale of love, desire and corruption is played out with outstanding, specially adapted music. The Music Cure stars Alison Buchanan, Peter Brathwaite and Oliver Brignall. Both productions have been adapted by composer and conductor Philip Hagemann who first collaborated with Pegasus Opera Company in 2018. Shaw Goes Wilde is a unique opportunity to showcase two British iconic Irish playwrights and present a diverse cast and creative team in a brand new venue in London – namely the Susie Sainsbury Theatre, part of the Royal Academy of Music. Richard Evans – Set and Costume Director. The two one-act shows performed on Friday 12, Saturday 13 at 7.30pm and Sunday 14 April at 2.30pm at the new Susie Sainsbury Theatre, Royal Academy of Music, London, NW1 5HT. These were 2 intriguing and very enjoyable operas, beautifully staged performed and conducted by the composer, Philip Hagemann, in the Royal Academies new stylish theatre.